Betting is 65% on the road favorite with the line moving from -4.5-106 to -4.5+105. Very close to a reverse line move favoring texas. Chris has the line at -4 which does complete the reverse line move. In addition, the top 25 teams tend to be overrated with the line, in particular, 9 through 25. Variables and models that I use for plays, however, are neutral. But the above to me would mean if your thinking about Notre Dame you might want to sit this game out. I am passing on the game. On Friday we had two 1 unit plays. In MLB Minn -104 lost 4-11 and in College Football our 1st play of the season won easily with Ball State +6.5 winning the game 31-21! Four out of five went our way with Cleveland moving .83!!! So far today I have sent out 2 Big Move Games. These are typically sent out between 4:00 and 5:00 AM PST. “These are games that based on what I look at have a good chance of the lines moving our way. It’s designed for people who also handicap on their own. For example with San Fran +135. 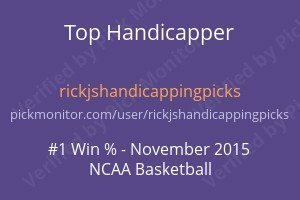 If you are handicapping and come up with the dog you would want to wager on the game right away. If you’re looking at the favorite however then you would wait. “Thanks for joining us! Remember at any time that you have any questions at all feel free to send me an email. 3. send me your cell phone number with the carrier and I will add you to the backup SMS …I do not suggest you only use that but if you do not have twitter and do not plan on getting it you will get all the plays via SMS if it’s working. That’s why I like to have 2 backups!!! 4. Read the must read portion of the site with the idea of incorporating the betting techniques into your routine on these plays. I can not stress enough that you use the bet sizing techniques that I recommend. Unless you’re a seasoned professional gambler there is no other way to bet these plays. It’s very hard to predict the number of plays per week for me. You can go back to the site and get a reasonable idea but my techniques get fine-tuned periodically which most of the time results in fewer plays. Not always however as often times I uncover some positive EV in areas I had not been looking at. So, I do not promise any number of plays. Whatever they come to that is what they are. MLB this season has had almost 400 plays. But it’s going to be far less with College and Pro football primarily because the # of games is dramatically less. Let me mention one last thing. If you’re a positive EV gambler the only thing you need worry about is Variance. And based upon my experience variance breaks many fine gamblers whose techniques are incredible but they play higher than they should. I will not get into why but it’s a fact that most gamblers regardless of their ability in the game of choice that they pick to indulge in let variance take them out. Most gamblers attribute it to bad luck:) There is no such thing as bad luck in gambling. It’s variance pure and simple. So knowing that you need to pick a bet sizing technique that reduces your chances of being taken out by variance. IT IS NOT OPTIONAL,ITS MANDATORY!!! I could give out 70% winners and if you do not handle variance you’re going to end up busted or impatient and either have to quit or decide to quit. The sad part is that handicapping and wagering are fun, challenging and profitable endeavors. 3. Pick a % amount to wager on, either 2% or 2.5% depending on your tolerance for risk. 3% is too high except for the few that have 0 money issues. Like Buffet or Gates. 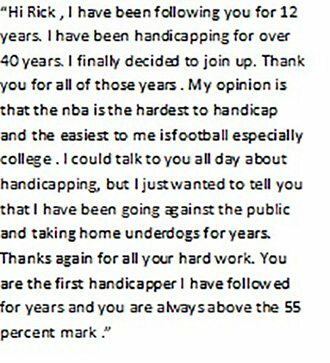 This is by far the most important thing I can tell you about gambling. After years in the poker rooms of Vegas, I can tell you that it’s remarkable how few gamblers even consider this. Ok…Back to handicapping for me. Going to be a busy day.